"Qipchaq" redirects here. For the village in Iran, see Qipchaq, Iran. The Kipchaks were a Turkic nomadic people and confederation that existed in the Middle Ages, inhabiting parts of the Eurasian Steppe. First mentioned in the 8th century as part of the Turkic Khaganate, they most likely inhabited the Altai region from where they expanded over the following centuries, first as part of the Kimek Khanate and later as part of a confederation with the Cumans. There were groups of Kipchaks in the Pontic–Caspian steppe, Syr Darya and Siberia. The Cuman–Kipchak confederation was conquered by the Mongols in the early 13th century. The Kipchaks described their name as meaning 'hollow tree'; according to them, inside a hollow tree, their original human ancestress gave birth to her son. Németh points to the Siberian qıpčaq "angry, quick-tempered" attested only in the Siberian Sağay dialect. Klyashtorny links Kipchak to qovı, qovuq "unfortunate, unlucky"; yet Golden sees a better match in qıv "good fortune" and adjectival suffix -čāq. Regardless, Golden notes that the ethnonym's original form and etymology "remain a matter of contention and speculation"
Their name appears occasionally transliterated in other languages, such as Arabic: قفجاق‎, translit. Qifjāq; Persian: قبچاق‎, translit. Qabčāq/Qabcâq; Georgian: ყივჩაყები; Turkish: Kıpçak; Crimean Tatar: Kıpçaq, Karachay-Balkar: Къыпчакъ, translit. Qıpçaq; Uzbek: Qipchoq, Қипчоқ/قىپچاق; Uyghur: قىپچاق‎/Қипчақ; Kazakh: Қыпшақ, translit. Qıpşaq; Kumyk: Къыпчакъ, translit. Qıpçaq; Kyrgyz: Кыпчак, translit. 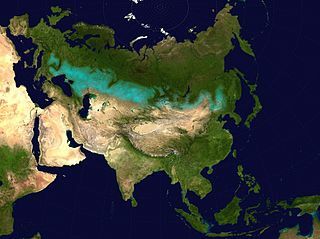 Qıpçaq; Nogai: Кыпчак; Chinese: 欽察/钦察; and Romanian: Copceac. Other English transliteration include Kypchaks and Qipchaks. In the Kipchak steppe, a complex ethnic assimilation and consolidation process took place between the 11th and 13th centuries. The western Kipchak tribes absorbed people of Oghuz, Pecheneg, ancient Bashkir, Bulgar and other origin; the eastern Kipchak merged with the Oghuz-Kimek, Karluk, Kara-Khitai and others. They were all identified by the ethnonym Kipchak. According to Ukrainian anthropologists, Kipchaks had racial characteristics of Caucasians and Mongoloids, namely a broad flat face and protruding nose. Researcher E. P. Alekseeva drew attention to the fact that European Kipchak stone images have both Mongoloid and Caucasoid faces. However, in her opinion, most Kipchaks, who settled in Georgia in the first half of the 12th century, were predominantly Caucasoid with some admixture of Mongoloid traits. They were already joined by Cumans. In the course of the Turkic expansion they migrated into Siberia and further into the Trans-Volga region. The Kipchaks appear in the 8th-century Moyun Chur inscription as Türk-Qïbchaq, mentioned as having been part of the Turkic Khaganate for fifty years. It is unclear if the Kipchaks could be identified as the Chueh-Yueh Shih (厥越失; pinyin: juéyuèshī) in Chinese sources or, according to Klyashtorny, the Syr in the Orkhon inscriptions (薛延陀; pinyin: Xuè-Yántuó in Chinese sources). The relationship between the Kipchaks and Cumans is unclear. Kipchaks of the Pontic–Caspian steppe. Kipchaks of the Syr Darya, associated with the Khwarazmian dynasty. Kipchaks of Siberia, later composing the Siberian Tatars. The early 11th century saw a massive Turkic nomadic migration towards the Islamic world. The first waves were recorded in the Kara-Khanid Khanate in 1017–18. It is unknown whether the Cumans conquered the Kipchaks or were simply the leaders of the Kipchak–Turkic tribes. By the 12th century, the two separate confederations of Cumans and Kipchaks merged. The Mongols defeated the Alans after convincing the Kipchaks to desert them through pointing at their likeness in language and culture. Nonetheless, the Kipchaks were defeated next. Under khan Köten, Kipchaks fled to the Grand Principality of Kiev (the Ruthenians), where the Kipchaks had several marriage relations, one of which was Köten's son-in-law Mstislav Mstislavich of Galicia. The Ruthenians and Kipchaks forged an alliance against the Mongols, and met at the Dnieper to locate them. After an eight-day pursuit, they met at the Kalka River (1223). The Kipchaks, who were horse archers like the Mongols, served as the vanguard and scouts. The Mongols, who appeared to retreat, tricked the Ruthenian–Kipchak force into a trap after suddenly emerging behind the hills and surrounding them. The fleeing Kipchaks were closely pursued, and the Ruthenian camp was massacred. The nomadic Kipchaks were the main targets of the Mongols when they crossed the Volga in 1236. The defeated Kipchaks mainly entered the Mongol ranks, while others fled westward. Köten led 40,000 families into Hungary, where King Bela IV granted them refuge in return for their Christianization. The refugee Kipchaks fled Hungary after Köten was murdered. After their fall, Kipchaks and Cumans were known to have become mercenaries in Europe and taken as slave warriors. In Egypt, the Mamluks were in part drawn from Kipchaks and Cumans. The Kipchak–Cuman confederation spoke a Turkic language. Mongolian ethno-linguistic elements in the Kipchak–Kimek remain unproven. Kipchaks and Cumans spoke a Turkic language (Kipchak language, Cuman language) whose most important surviving record is the Codex Cumanicus, a late 13th-century dictionary of words in Kipchak, Cuman, and Latin. The presence in Egypt of Turkic-speaking Mamluks also stimulated the compilation of Kipchak/Cuman-Arabic dictionaries and grammars that are important in the study of several old Turkic languages. When members of the Armenian diaspora moved from the Crimean peninsula to the Polish-Ukrainian borderland, at the end of the 13th century, they brought Kipchak, their adopted Turkic language, with them. During the 16th and the 17th centuries, the Turkic language among the Armenian communities of the Kipchak people was Armeno-Kipchak. They were settled in the Lviv and Kamianets-Podilskyi areas of what is now Ukraine. The Kipchaks practiced Shamanism. Muslim conversion occurred near Islamic centres. Some Kipchaks and Cumans were known to have converted to Christianity around the 11th century, at the suggestion of the Georgians, as they allied in their conflicts against the Muslims. A great number were baptized at the request of Georgian King David IV, who also married a daughter of Kipchak Khan Otrok. From 1120, there was a Kipchak national Christian church and an important clergy. Following the Mongol conquest, Islam rose in popularity among the Kipchaks of the Golden Horde. The confederation or tribal union which Kipchaks entered in the 8th- or beginning of 9th century as one of seven original tribes is known in historiography as that of the Kimek (or Kimäk). Turkic inscriptions do not mention the state with that name. 10th-century Hudud al-'Alam mentions the "country of Kīmāk", ruled by a khagan (king) who has eleven lieutenants that hold hereditary fiefs. Furthermore, Andar Az Khifchāq is mentioned as a country (nāḥiyat) of the Kīmāk, 'of which inhabitants resemble the Ghūz in some customs'. In the 9th century Ibn Khordadbeh indicated that they held autonomy within the Kimek confederation. They entered the Kimek in the 8th- or beginning of 9th century, and were one of seven original tribes. In the 10th-century Hudud al-'Alam it is said that the Kimek appointed the Kipchak king. The modern Northwestern branch of the Turkic language is often referred to as the Kipchak branch. The languages in this branch are mostly considered to be descendants of the Kipchak language, and the people who speak them may likewise be referred to as Kipchak peoples. Some of the groups traditionally included are the Karachays, Siberian Tatars, Nogays, Bashkirs, Kazakhs, Kyrgyz, Volga Tatars, and Crimean Tatars. There is also a village named Kipchak in Crimea. Kypshak is one of the constituent tribes of the Middle Horde confederation of the Kazakh people. The name Kipchak also occurs as a surname in Kazakhstan. Some of the descendants of the Kipchaks are the Bashkirian clan Qipsaq. Ayyub Khan (fl. 1117), Kipchak leader. Bačman (fl. 1229–36), Kipchak leader in the Lower Volga. Qačir-üküle (fl. 1236), Kipchak leader in the Lower Volga. Köten (fl. 1223–39), Kipchak leader. Wikimedia Commons has media related to Kipchaks. ^ Julian Baldick, Animal and Shaman: Ancient Religions of Central Asia, p.55. ^ a b Agajanov 1992, p. 74. ^ Carl Waldman; Catherine Mason (2006). Encyclopedia of European Peoples. Infobase Publishing. pp. 475–. ISBN 978-1-4381-2918-1. ^ a b c d e f g h i j k l Golden 1990, p. 278. ^ Golden 1990, p. 271. ^ a b c Agajanov 1992, p. 69. ^ Golden 1990, pp. 278–279. ^ a b c d e Golden 1990, p. 279. ^ Vásáry 2005, p. 6. ^ a b c d e f g h May 2016, p. 96. ^ a b c d May 2016, p. 103. ^ a b May 2016, p. 221. Agajanov, S. G. (1992). "The States of the Oghuz, the Kimek and the Kipchak". History of Civilizations of Central Asia, Volume IV: The Age of Achievement AD 750 to the End of the Fifteenth Century. Motilal Banarsidass. pp. 61–76. ISBN 978-81-208-1595-7. Golden, Peter B. (1990). "The peoples of the south Russian steppes". In Sinor, Denis (ed.). The Cambridge History of Early Inner Asia. Cambridge University Press. pp. 256–284. ISBN 978-0-521-24304-9. Howorth, Henry Hoyle (2008) . History of the Mongols from the 9th to the 19th Century, Part 2: The So-Called Tartars of Russia and Central Asia. Cosimo, Inc. ISBN 978-1-60520-134-4. Timothy May (7 November 2016). The Mongol Empire: A Historical Encyclopedia [2 volumes]: A Historical Encyclopedia. ABC-CLIO. pp. 221–. ISBN 978-1-61069-340-0. Hildinger, Erik. Warriors of the Steppe: Military History of Central Asia, 500 BC To 1700 AD. Da Capo Press, 1997. Galip Güner (2013), Kıpçak Türkçesi Grameri, Kesit Yayınları, İstanbul. "Kipchak" Encyclopædia Britannica, Academic Edition. 2006. "Polovtsi" The Columbia Encyclopedia, Sixth Edition. 2001-05. Boswell, A. Bruce. "The Kipchak Turks." The Slavonic Review 6.16 (1927): 68-85. Győrfi, Dávid. "Khwarezmian: Mapping the Kipchak component of Pre-Chagatai Turkic." Acta Orientalia 67.4 (2014): 383-406. Shanijazov, K. "Early Elements in the Ethnogenesis of the Uzbeks." The Nomadic Alternative: Modes and Models of Interaction in the African-Asian Deserts and Steppes (1978): 147. Ushntskiy, Vasiliy V. "KIPCHAK COMPONENT IN THE SAKHA ETHNOGENESIS." VESTNIK TOMSKOGO GOSUDARSTVENNOGO UNIVERSITETA-ISTORIYA 3 (2015): 97-101. Mukhajanova, T. N., and A. M. Asetilla. "KIPCHAK" ETHNONYM AND THE HISTORY OF ITS ORIGIN." International Scientific and Practical Conference World science. Vol. 3. No. 12. ROST, 2016. Baski, Imre. "On the ethnic names of the Cumans of Hungary." Kinship in the Altaic World. Proccedings of the 48th PIAC (2006): 43-54. Róna-Tas, András. "The reconstruction of Proto-Turkic and the genetic question." (1998). Biro, M. B. "The «Kipchaks» in the Georgian Martyrdom of David and Constantin." Annales. Sectio linguistics 4 (1973). Kadyrbaev, Aleksandr. "Turks (Uighurs, Kipchaks and Kanglis) in the history of the Mongols." Acta Orientalia 58.3 (2005): 249-253. Halperin, Charles J. "The Kipchak Connection: The Ilkhans, the Mamluks and Ayn Jalut." Bulletin of the School of Oriental and African Studies 63.2 (2000): 229-245. Eckmann, János. "The Mamluk-Kipchak Literature." Central Asiatic Journal (1963): 304-319. The Cumans were a Turkic nomadic people comprising the western branch of the Cuman–Kipchak confederation. After the Mongol invasion (1237), many sought asylum in the Kingdom of Hungary, as many Cumans had settled in Hungary, the Second Bulgarian Empire, and Anatolia before the invasion. The Kimek–Kipchak confederation was a medieval Turkic state formed by the Kimek and Kipchak people in the area between the Ob and Irtysh rivers. From the end of the 9th century to 1050, it existed as a khaganate, and as a khanate until the Mongol conquest in the early 13th century. The Oguz Yabgu State was a Turkic state, founded by Oghuz Turks in 766, located geographically in an area between the coasts of the Caspian and Aral Seas. Oguz tribes occupied a vast territory in Kazakhstan along the Irgiz, Yaik, Emba, and Uil rivers, the Aral Sea area, the Syr Darya valley, the foothills of the Karatau Mountains in Tien-Shan, and the Chui River valley. The Oguz political association developed in the 9th and 10th centuries in the basin of the middle and lower course of the Syr Darya and adjoining the modern western Kazakhstan steppes. Kangar union, Kazakh: Қaңғар Oдағy was a Turkic state in the territory of the entire modern Kazakhstan without Zhetysu. The ethnic name Kangar is a medieval name for the Kangly people, who are now part of the Kazakh, Uzbek, and Karakalpak nations. The capital of the Kangar union was located in the Ulytau mountains. The Pechenegs, three of whose tribes were known as Kangar, after being defeated by the Oghuzes, Karluks, and Kimek-Kypchaks, attacked the Bulgars and established the Pecheneg state in Eastern Europe.